Do not use a cellular phone or perform Bluetooth® settings (e.g. pairing a phone) while driving. Some Bluetooth®-enabled phones may not be recognized by the system or fully compatible with the system. Before using Bluetooth® related features of the audio system, refer your phone’s User’s Manual for phone-side Bluetooth® operations. The phone must be paired to the audio system to use Bluetooth® related features. Do not place the phone near or inside metallic objects, otherwise communications with Bluetooth® system or cellular service stations can be disturbed. While a phone is connected through Bluetooth® your phone may discharge quicker than usual for additional Bluetooth®-related operations. Please save your phone name in English, or your phone name may not be displayed correctly. 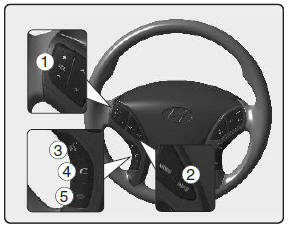 Bluetooth phone compatibility can be checked by visiting www.hyundaiusa.com and under the SERVICE & PARTS - BLUETOOTH COMPATIBILITY menu. Areas that can be checked - 9 areas, such as Pairing, Connection, Handsfree Calling, Streaming, etc. 1. VOLUME button : Raises or lowers speaker volume. 2. MUTE : Mute the microphone during a call. 3. button : Activates voice recognition. 4. button : Places and transfers calls. 5. button : Ends calls or cancels functions.